We must find cleaner, safer alternatives to these ecosystem-fouling, climate-disrupting extreme fossil fuels like tar sands and fracked oil shale, and their exploding oil trains, bursting pipelines, and accident-prone refineries. The San Luis Obispo County Planning Commission rejected Phillips 66’s plan to bring in millions of gallons of toxic crude daily in 2016, and the Board of Supervisors rejected their appeal in March 2017. This February, San Luis Obispo County will be deciding on a Phillips 66 plan to bring mile-long oil tanker trains into their Nipomo Mesa plant five days a week, each carrying 2.4 million gallons of toxic and volatile petroleum across California. So, why should the rest of us care? Well, the descriptive term is bomb trains. Five times around North America in 2015 oil trains have crashed causing massive explosions, spills of caustic crude into rivers, fires that burn out of control, and significant property damage. The list is daunting: May 2015 in Heimdal, North Dakota, six cars of a 109-car train exploded into flames with 60,000 gallons of oil spilled. In March, an oil train derailed near Gogoma, Ontario, with a fire that destroyed a bridge. This only 23 miles from a February oil train accident where the fire burned for days. Evacuations and extreme explosions have become a game of Russian roulette, and first responders can only wonder where is next? In March of 2015, near Galena, Illinois, 21 cars of a 105-car oil train derailed and burst into flames. And in February, a 109-car CSX oil train derailed and caught fire near Mount Carbon, West Virginia, leaking oil into the Kanawha River tributary, with a fire that burned for most of a week. In all of these accidents the tankers were retrofitted with protective shields to meet a higher safety standard than federal law requires, meaning the biggest problem in a world of problems was the flammable fracked oil shale or tar sands crude involved. Four more accidents happened in Tennessee, Montana and Wisconsin in 2015 where significant oil, fuel or corrosive chemicals were spilled, but without a major explosion. The worst oil train accident by far happened July 5, 2013, with an unattended runaway train carrying fracked North Dakota Bakken shale oil, derailing and catching fire in the town of Lac-Megantic, Quebec. Forty-seven people were killed and thirty buildings burned. 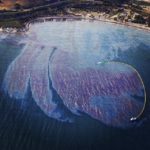 About 1.6 million gallons of oil was spilled. Several things are clear here: the rail tanker cars, emergency response plans, braking equipment requirements, and railroad track maintenance are inadequate. And we must find cleaner, safer alternatives to these ecosystem-fouling, climate-disrupting extreme fossil fuels like tar sands and fracked oil shale. While oil production isn’t increasing in North America right now due to the low price of oil, industry efforts to lift the current ban on exporting crude oil could result in a huge increase in fracked oil production. In turn, that oil will be put on trains that will head to coastal facilities and be loaded on tankers and sent to Asia. Map of oil train routes through California by ForestEthics. 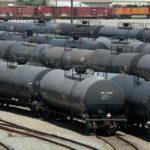 A recent analysis by the Center for Biological Diversity found that 500,000 students in California attend schools within a half-mile of rail tracks used by oil trains, and more than another 500,000 are within a mile of what some are calling the “blast zone.” In addition to the threat posed to California’s students, the report Crude Injustice on the Rails released last year by ForestEthics and Communities for a Better Environment, pointed out that in California the communities within the half-mile blast zones were also more likely to be low-income minority neighborhoods. According to the environmental analysis on the Philips 66 oil train expansion in San Luis Obispo County, crude oil would begin moving through Los Angeles between the Inland Empire and the San Fernando Valley, passing through the Chatsworth/Northridge area already facing the largest fossil fuel gas leak blowout since the BP Deepwater Horizon, with no ability to deal with more blowouts. Furthermore, residents there remember well the 2008 Metrolink accident that took 17 lives, even without volatile crude oil added to the mix. Responding to pressure from activists, the Los Angeles City Council passed a unanimous resolution last September to oppose this project. They were not alone: six counties and 21 cities passed similar motions asking SLO to reject the project. The oil train route would wind along the L.A. River, a source of water and recreation undergoing a $1.3 billion makeover, passing homes, hospitals, and parks, through downtown where hipster apartments and sparkling office-and-shopping megaplexes are sprouting up. The eventual goal is for oil trains to head down through South LA toward the Harbor Area, the location of the largest concentration of oil refineries in the state, and where citizen activism stopped a Valero Oil Train Expansion in 2014. The cost of our oil addiction already disproportionately impacts these communities with toxic air quality, asthma and other maladies, noise, and the threat of accidents. Time for an intervention to heal this debilitating addiction now. The oil train route will run along the coast of Santa Barbara County where the 2015 Refugio State Park oil pipeline blowout and spill occurred. We must seek alternatives to risking our precious resources. Photo By Jack Eidt. Alternatives to the Explosive Addiction? We must reject regular bomb train accidents as a cost of business as usual in our fast-paced, technology-addled world. We can continue to retrofit our cities and towns to provide alternatives to gridlocked freeways, with accessible public transit, car-sharing and autonomous (self-driving) technologies, free-flowing bicycle throughways, and walkable neighborhoods. We can invest in the development of more efficient automobiles made of fiber composites, powered by solar and wind power or advanced biofuels. Instead of bringing tar sands crude from the strip-mined Boreal forests of Alberta, the Phillips 66 Santa Maria Refinery should transition their workers into providing sustainable energy for the 21st Century. Our communities and our planet demand a world with clean air and water, safe from exploding bomb trains. Jack Eidt serves on the Steering Committee of SoCal 350 Climate Action, a Los Angeles affiliate of the international climate change organization 350.org.